Today's baleen whales (Mysticetes) support their massive bodies by filtering huge volumes of small prey from seawater using comb-like baleen in their mouths much like a sieve. But new evidence reported in the journal Current Biology on May 10 based on careful analysis of a 34-million-year-old whale skull from Antarctica—the second-oldest "baleen" whale ever found—suggests that early whales actually didn't have baleen at all. Their mouths were equipped instead with well-developed gums and teeth, which they apparently used to bite large prey. "Llanocetus denticrenatus is an ancient relative of our modern gentle giants, like humpback and blue whales," says Felix Marx of the Royal Belgian Institute of Natural Sciences. "Unlike them, however, it had teeth, and probably was a formidable predator." 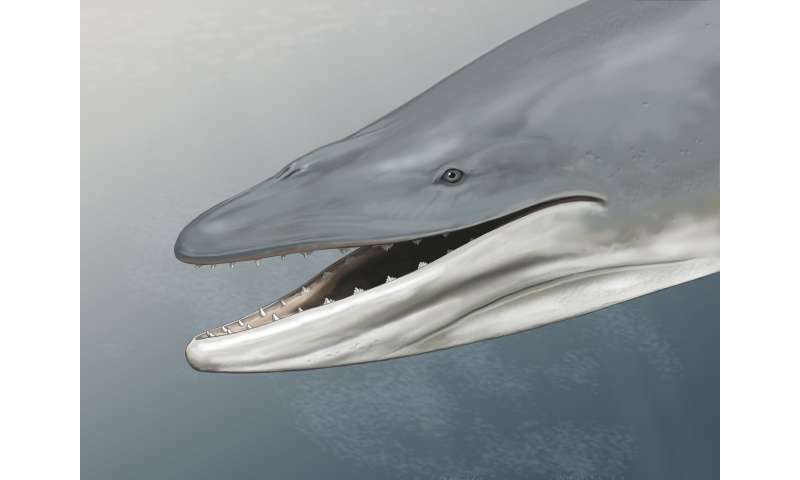 "Until recently, it was thought that filter feeding first emerged when whales still had teeth," adds R. Ewan Fordyce at the University of Otago in New Zealand. "Llanocetus shows that this was not the case." "Instead of a filter, it seems that Llanocetus simply had large gums and, judging from the way its teeth are worn, mainly fed by biting large prey," Marx says. "Even so, it was huge: at a total body length of around 8 meters, it rivals some living whales in size." The findings suggest that large gums in whales like Llanocetus gradually became more complex over evolutionary time and, ultimately, gave rise to baleen. That transition probably happened only after the teeth had already been lost and whales had switched from biting to sucking in small prey—as many whales and dolphins now do. Marx and Fordyce suggest that baleen most likely arose as a way to keep such small prey inside the mouth more effectively. "Llanocetus presents a lucky combination, where the shape of the bones, small features suggesting the course of soft tissues, and tooth wear all combine to tell a clear story," Fordyce says. "Crucially, Llanocetus is also extremely old and lived at the very time when Mysticetes first appeared. As such, it provides a rare window into the earliest phase of their evolution." The findings show that the evolution of filter feeding wasn't as straightforward as previously thought, the researchers say. They'd now like to sort out when filter feeding and baleen first evolved. "The giants of our modern ocean may be gentle, but their ancestors were anything but," Marx says. "Llanocetus was both large and a ferocious predator and probably had little in common with how modern whales behave."